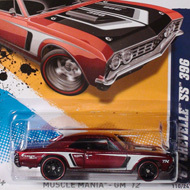 4/10 from the Muscle Mania – Mopar ’12 series and part of the 2012 Secret Treasure Hunt set. 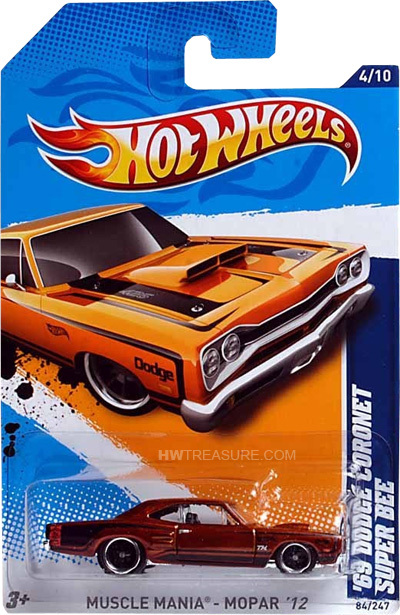 The Coronet boasts brownish orange Spectraflame paint with black graphics, “TH”, “Dodge”, and the Hot Wheels logo on the sides, and “426” on the hood. It has clear windows, a black interior, gray 10-spoke Real Rider wheels, and a chrome plastic Malaysia base.